While the genocide has been chronicled by historians, Turkey has denied it occurred, saying the deaths of Armenians was a function of the chaos of World War I.
Tens of thousands of Angelenos gathered near Little Armenia for the 103rd anniversary of the Armenian genocide. John Cádiz Klemack reports for NBC4 News at 5 p.m. on Tuesday, April 24, 2018. 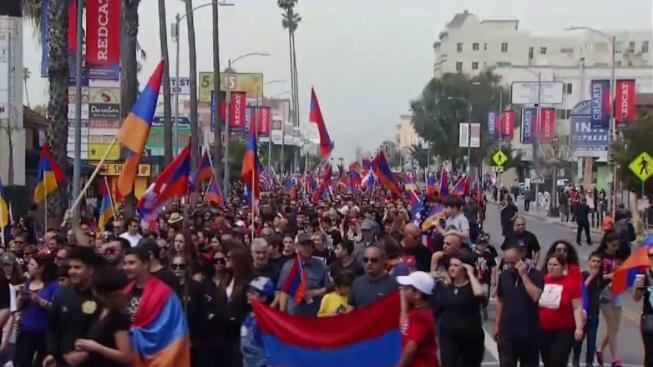 Thousands of marchers, many waving flags, in the Little Armenia area outside Hollywood gathered Tuesday in the first of two marches to commemorate the 103rd anniversary of the Armenian genocide, which Turkey insists did not happen. The first gathering, organized by Unified Young Armenians, began near Hollywood Boulevard and Western Avenue, where participants waved flags and began a circular march through the area, denouncing the genocide and calling on the United States government to officially recognize it. "It's an important thing for the Armenian community, and hopefully to spread awareness to American citizens," one participant told NBC4 at the onset of the rally. Another said simply, "We're here to demand for the entire world to recognize the Armenian Genocide." The thousands of marchers embarked on a circular route east on Hollywood Boulevard, south on Normandie Avenue, west on Sunset Boulevard then north on Hobart Boulevard. Los Angeles police said all the affected streets will be closed until at least 3 p.m. A second rally, organized by the Armenian Genocide Committee, will begin around midday at Pan Pacific Park at 7600 Beverly Blvd., ending at the Turkish Consulate at 6300 Wilshire Blvd. The march will proceed south adjacent to The Grove shopping center, then west on Third Street, south on Fairfax Avenue then west on Wilshire Boulevard. LAPD officials said all streets affected by the march will be closed from 10 a.m. to 6 p.m. The Armenian genocide began in 1915 and resulted in the deaths of as many as 1.5 million Armenians in a campaign blamed on the Ottoman Turkish government. While the genocide has been chronicled by historians, who often view it as having been ethnic cleansing, Turkey has denied it occurred, saying the deaths of Armenians was a function of the chaos of World War I, which also claimed Turkish lives. More than 200,000 people of Armenian descent live in Los Angeles County, making the Southland home to the largest Armenian community outside of Armenia. Despite calls by some legislators -- most notably Rep. Adam Schiff, D- Burbank -- for the federal government to formally recognize the genocide, U.S. presidents have long refused to do so. President Donald Trump issued a statement in which he, like past U.S. presidents, declined to refers to the deaths of 1.5 million people as a "genocide." In the annual White House statement, Trump commemorated the start of "one of the worst mass atrocities of the 20th century, when one and a half million Armenians were deported, massacred or marched to their deaths in the final years of the Ottoman Empire. We recall the horrific events of 1915 and grieve for the lives lost and the many who suffered. "We also take this moment to recognize the courage of those individuals who sought to end the violence, and those who contributed to aiding survivors and rebuilding communities, including the U.S. Ambassador to the Ottoman Empire, Henry Morgenthau, who sought to end the violence and later raised funds through the Near East Relief to help the Armenian people. We note with deep respect the resilience of the Armenian people, so many of whom built new lives in the United States and have made countless contributions to our country. "As we honor the memory of those who suffered, we also reflect on our commitment to ensure that such atrocities are not repeated. We underscore the importance of acknowledging and reckoning with painful elements of the past as a necessary step towards creating a more tolerant future. "On this solemn day, we stand with the Armenian people throughout the world in honoring the memory of those lost and commit to work together to build a better future," he said. Former President Barack Obama, a Democrat, also did not recognize the genocide during his eight years in office, despite indications during his original campaign that he would do so. Gov. Jerry Brown issued a proclamation Tuesday declaring a Day of Remembrance of the Armenian Genocide. "Between 1915 and 1923, Armenians were subjected to torture, starvation, mass murder and exile from their historic homeland," according to the proclamation. "1.5 million lost their lives. The Armenian Genocide, also known as the 'First Genocide of the Twentieth Century,' represented a deliberate attempt by the Ottoman Empire to eliminate all traces of a thriving, noble civilization." Rep. Adam Schiff (D-CA), a lead sponsor of a resolution to recognize the Armenian genocide, also issued a statement Tuesday in which he demanded the mass killings be recognized as genocide. "Today, the world marks the 103rd anniversary of the Armenian Genocide, the systematic murder of 1.5 million Armenian men, women and children, and the displacement of millions more in the Ottoman Empire from 1915 to 1923. Leaders of countries all over the world have issued statements commemorating the genocide and vowed that it will never happen again. That's why we are marching against genocide and hatred, and why we pledge that we will never forget and we will never give up. "More than a century after the Armenian Genocide, it is our solemn responsibility to remember those who were lost, to seek justice and restitution, and to educate Americans and the world about the crime of genocide. Despite Turkey’s denials and protestations to this day, there is no historical debate and there can be no equivocation. By refusing to officially recognize the Armenian genocide, America is simply not living up to its moral responsibility and undermining its leadership on human rights. "The attempted extermination of the Armenian people was so horrific that a new word was needed to capture the magnitude of the crime of attempted race extermination. We must not be afraid to speak the truth or give in to Turkey’s campaign of denial. America must call the Armenian Genocide what it was – genocide."